I was first introduced to VersaTiles several years ago when one of our math teachers used them for after school math tutoring. I always thought that they were used only for math, but I recently discovered that they also have resources for science, readiness, and reading/language arts! 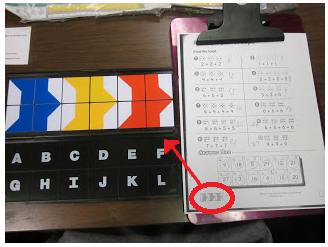 VersaTiles takes worksheets to he next level by requiring students to place number tiles on a corresponding letter that matches their answer. When all of the tiles have been placed, the students closes the answer case, flips it, and opens it back up. If the pattern matches the one at the bottom of the worksheet, the students has successfully answered all of the questions correctly. If the pattern does not match, the students can easily find their mistakes and make corrections. I chose the Science Starter Kit because I have a hard time fitting in extra science activities. All of the workbooks have activities that fit perfectly with our scope and sequence. My students have done activities relating to weather, the moon, and plants. They are great for independent work or small groups. The Science Starter Kit include a Teacher Resource Guide, 2 Science Process Skills, Earth Science, Physical Science , and Life Science books. It also includes one answer case. Students can work independently once they learn how to use VersaTiles. VersaTiles are engaging and challenging. Students can self-check their work and make corrections. Win a VersaTiles Science Starter Kit! I would bring them when subbing until I get a teaching job to use for early finishers. I think children would love it! You are an awesome teacher, Brian! I love these tiles! They are so many uses for them! So true! I would love to try the Reading Versa Tiles too! I've know about these for 20 years. Now I'm using them in my 2nd grade classroom too! The students are super engaged. They love the immediate feedback! Wow! I did not realize that they have been around for 20 years! I would love to use these as station work! Anything that is self-checking is great for stations! I used to use these for after-school tutoring and the students enjoyed them. The school I teach at now does not have these, and I forgot about them. I would love to add these to a learning center for the students. They great for afterschool tutoring! These would be great for centers! I would use them for centers and early finishers. Great for early finishers...I have quite a few this year. These would be used for extra practice for students needing help. Yes, there are different skill levels which helps differentiation. I would use them in my efforts to differentiate content for all of my students. They are an amazing tool! Great idea! Some activities are more challenging than others. Wow! These would be well used at our Science Camps every Saturday to get our kids ready for the STAAR test! Our school district doesn't have the money to purchase extra resources and my budget is about broke with everything I have bought for my kids. I hear ya! Put these at the top of your list for next year - If you win, you will want to order more answer cases. My son's teacher has used these in her classroom. I teach a self-contained classroom, and would love to win these for my students. They are perfect for self-contained classrooms. I would love to use these in order to bridge gaps for my ESE students. I know they would feel successful and enjoy learning with them! Yes, there are a lot of visuals on the activity pages. I tutor math, and have used this before when I taught at a school. I even have made up my own worksheets to work with the VersaTiles. Wow! That's a great idea. Tailor them to fit your needs! These would be great in our afterschool tutoring program. I would love to have a set of these for science review. We have outdated textbooks for our students and I would use these to strengthen students understanding of concepts!! Yes, Our textbooks are old too. I never use them. I used "borrowed" ones last year, but I had to return them. :-( Would love to have my own set for students to use during workshop or for early finishers during math. It's always nice to have your own stuff! I'm glad to know they have them for science! I was thrilled when I found out they had science VersaTiles! Yes! They are unique and challenging! Perfect for reteaching and small groups! I would use them with my AIS students. They love hands on activities. And so do I.
I have used the math sets before and love them! I bet my students would love to have them for science!! I love VersaTiles, but do not have enough in my classroom, so my students are frustrated. They all want to work with a partner using a VersaTiles kit. I would use the language arts for fifth grade if I won. I absolutely love that they are self checking, and fun too. They work nicely for partner work! I would use these to help struggling students and those who needed extra practice. Yes,these have varying skill levels and would be nice for struggling students. I love these, I use them as a way to differentiate, using the templates given, and creating different activities on the same topic. As a review lesson one day, I had the students create their own Versatile activity to have other do. They loved it! I would use them for independent learners for a review. It could also be used for more practice for struggling learners. I love Versatiles! I use them all the time in my math class. I would love to win the science set to give to my awesome team mate. I could use these with my Intervention kiddos who really struggle with foundational skills. I bought these about 20 years ago for my own children and then started using them in my classroom. I love them and more importantly my students love them. I am so glad to have found a place to buy them. Mine are pretty rough after all these years of use. These would be great for the kids in my class. I didn't realize they had Versa Tiles for Science! I want them in every subject, my kids love them! sometimes it's hard to remember things. These would help with learning science facts and concepts.